The AB says I could have a whole blog on packing and traveling tips. But if you asked me what my top tip was, I’d say modular packing. In addition to all the pockets in various suitcases, I’m a believer in keeping everything as modular as possible. I picked up two sets of clear with colored zipper tops, 7 different sizes, from Marshalls for $10 per set. I find them endlessly useful. 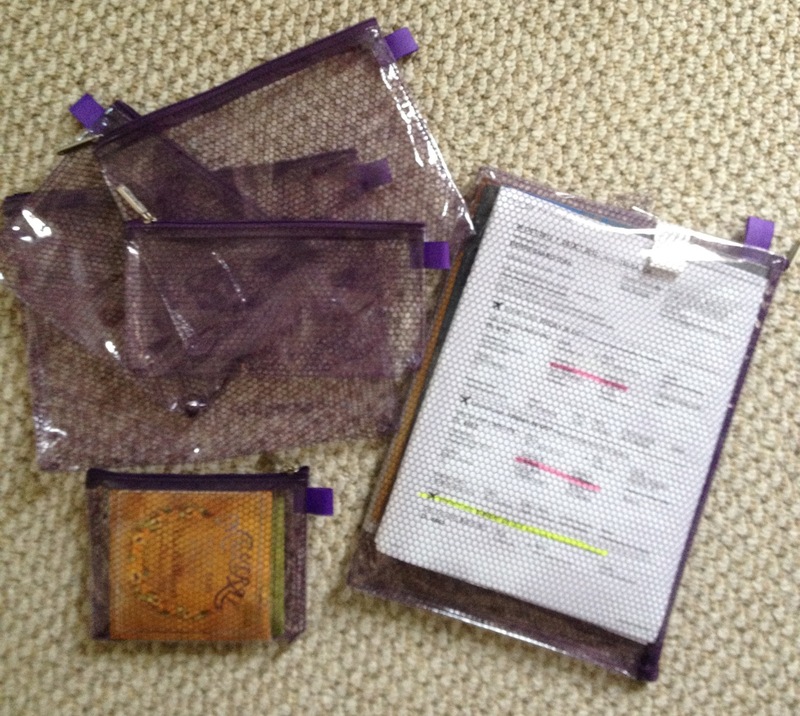 I like to use the largest baggie for my itinerary, magazines, and lecture notes to review on the plane. I find it works better than a folder, nothing falls out. 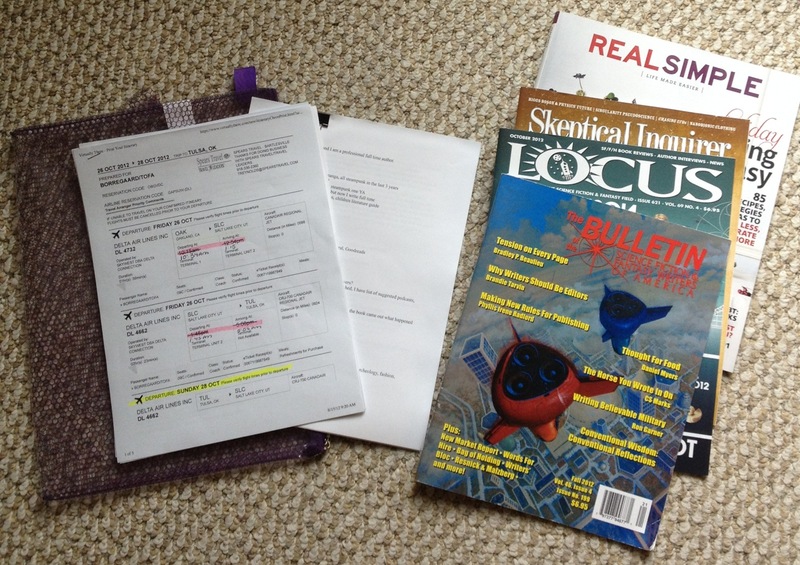 Also it accommodates both paper sizes for international trips. This one is packed for WorldCon already (hence all the extra tea, WorldCon is a tea heavy undertaking). There is the customary tea supply (14 bags, two for each day) plus about 5 raspberry leaf, creamer (I need to steal more) for emergency use only, and the water boil coil with European adapter. Sometimes, if I have room, I will also throw in my special plastic hot liquid mug from France. I have a hanging roll. I got it free with a magazine in England some 15 years ago and I will be CRUSHED when it finally dies, there doesn’t seem to be anything else like it out there. My event makeup lives in this at all times rolled up under the sink, travels, and then hangs in the hotel room once I land. I’ve arranged it so there are no liquids, thus I never have to worry about TSA. So far airport security has never asked me to unroll it. I use a jewelry roll for my jewelry, no picture, it’s just a cheepie from Marshalls. I have three kits: long haul, on-plane, and short haul. 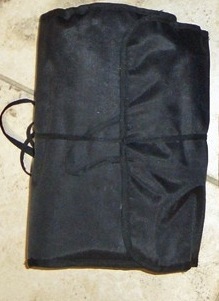 The black long haul stands up on its own, great for hotels, and gets wrapped in a plastic bag inside my checked luggage, so it doesn’t have to be clear. The others are for carry-on. 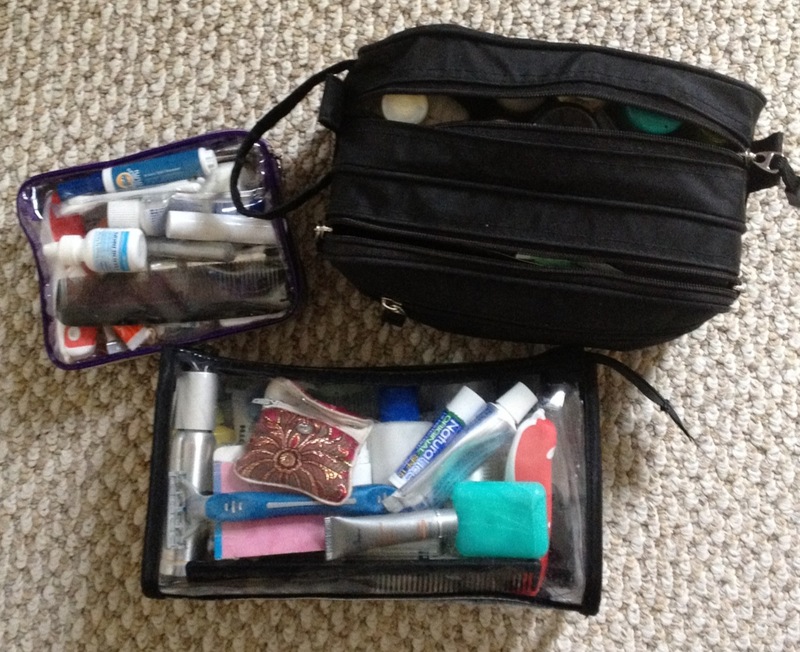 The littlest one is for on-plane long flights when the long haul toiletry is already checked. It is comprised mainly of solid state products and sample products in tiny packages so it gets through security without having to be removed. But it’s clear just in case. Eye drops and and chapstick are a must. Also this kit should work for at least one overnight in case of getting stranded. 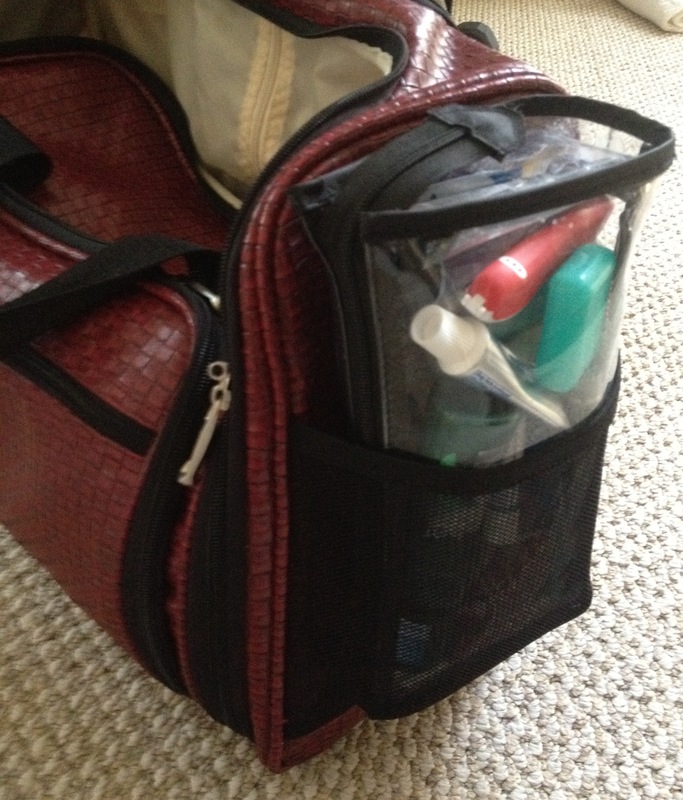 The larger clear bag, for weekend short haul trips, does have to be taken out at security, so it lives in the outside pocket of my carry-on for ease of access. 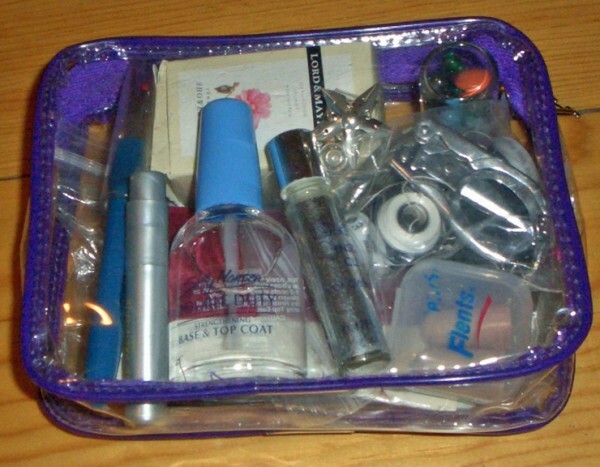 Here’s a blog I did already on the contents of my fashion emergency kit. Things like scarves, fans, folding tote bag, notebooks and my smaller convention wallet usually all go into my purse before the flight along with my purse kit and extra pens phone and such. So there you have it, my survival packing. Of course, I should never presume that you would take the same things, but perhaps I have tipped you off to a few that you might have forgotten. Here’s the Domestic CEO on basic packing tips. I’m surprise interviewed about some awful tea by Chris Garcia at WorldCon.